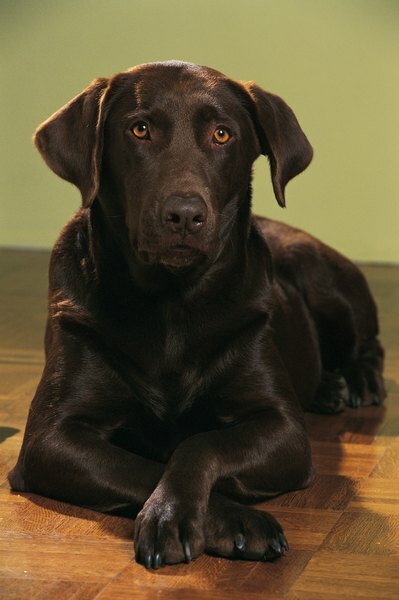 Velvety, sleek chocolate Labs are one of the most popular color of Labrador retrievers. Chocolate Labradors, once considered the "ugly duckling" of the three colors of this retriever breed, are nowadays considered one of the most beautiful. With their endearing personalities and willingness to please, the chocolate Lab, along with the black and yellow Lab, has earned the top spot in the hearts of millions. Chocolate Labs have been known in the breed as long as the black and yellow Labs. However, it was not until the 20th century that they were recognized in the U.S. Until then, both yellow and chocolate Labs were less favored than the black Lab, and not considered good enough for showing. The chocolate color is not inherited as a simple recessive gene, which makes it difficult for breeders to establish a definite breeding pattern for producing consistently chocolate-colored dogs with the same color intensity and dark points. Some geneticists believe the chocolate color is produced through a modifying action by genes of partial dominance that dilute or blend with the color produced by genes for other colors. The chocolate Lab's color ranges from medium to dark chocolate, not too light or washed-out looking. White markings on the chest are allowed, but not desirable in the breed standard. Brindle patterns or tan markings are disqualified. The intensely rich color of the chocolate coat color paired with a short-hair coat makes "chocolates" look like pure velvet. Light eyes have oftentimes been a problem for breeders of chocolate Labs who were trying to achieve dark chocolate or black eyes. Some breeders will successfully breed for dark eyes by breeding only black labs that are known producers of chocolates. Even though some may not like light eyes, it's hard to disagree that the contrast between a chocolate-colored coat and eyes of light brown, green, hazel or golden yellow give a dog a truly outstanding presence that appeals to many chocolate Lab owners. Like all Labs, chocolates possess a sweet, soft demeanor. Eyes truly are the window to the soul of a Lab. Kind and friendly, their eyes tell the whole story of this engaging, outgoing breed. Bred to point, flush and retrieve game, this soft-mouthed dog has stamina and energy to spare, making him a treasured hunting companion. Easy to train, chocolate Labs excel in field trials and in the obedience ring. Steady and reliable, they are remarkable search-and-rescue dogs, guide dogs to the blind and assistance dogs to the physically-challenged.